Norma Miller was first discovered as a gifted young Lindy Hopper by Herbert “Whitey” White when she was just 14 years old. Since she was too young to go into the Savoy Ballroom, she often danced outside on the sidewalk where the music could be heard quite well. The first time Whitey saw her, she appeared out of nowhere on the dance floor and won a Savoy dance contest with Twistmouth George as her partner. Not long after that, Whitey was watching some of his dancers in a contest at the Apollo and once again saw young Norma defeat his dancers. The next day Whitey appeared at Norma’s home and told her he would prefer her to dance with him rather than against him. He invited her to join Whitey’s Lindy Hoppers. Apparently he had ways of averting the authorities that enforced the laws about minors. 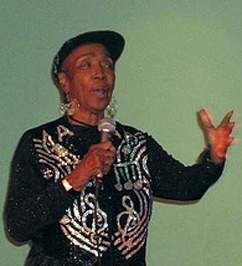 Norma Miller was the youngest of Whitey’s Lindy Hoppers when she joined the group. She was from the start a very creative dancer with her own often-comic style and she possessed an outstanding sense of rhythm. A vivacious and outspoken person, she was and still is always the life of every party. Norma has been in show business ever since those sidewalk days. After Whitey’s Lindy Hoppers disbanded in the early forties, she formed her own company in California, Norma Miller’s Dance Company and had her own show at the legendary “Club Alabam” in the Watts section of L.A. In the early fifties she, Billy Ricker and drummer Michael Silvers worked as the Del Rio Trio, until the night Sammy Davis Jr. saw the group and promptly hired away Mike Silvers to be his drummer. In the later fifties she formed Norma Millers Jazz Men, which included fellow Lindy Hopper Billy Ricker, Frankie Manning’s son (the tap dancer Chazz Young), Billy Dotson, Stoney Montenez and Raymond (?). As a comedienne, Norma worked in Las Vegas with Redd Foxx for over 10 years, including appearances in his TV show, “Sanford and Son” where she is remembered as the airline stewardess who offered “Coffee, tea or ME?” In the seventies she formed another Lindy Hop and Jazz performance group, the “Savoy Swingers”. In addition to many standard entertainment venues, this group did a series of performances in the New York City public school system, introducing African-American dance history to the new generation. 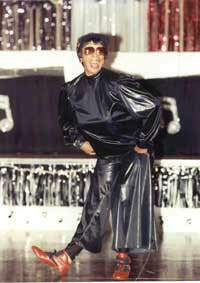 A lifelong close friend of Frankie Manning, Norma danced with him in Spike Lee’s feature film, “Malcolm X”, and in Debbie Allen’s TV Film “Stomping at the Savoy”, which she choreographed with Frankie as her assistant. Today, Norma continues to work as a comedienne and choreographer in Las Vegas. Now we can all enjoy Norma’s telling of her life story with the publication of her book ‘Swingin’ at the Savoy by Temple University Press.